Ruins of Laramidia: Laramidian Appendix N: Gwangi! 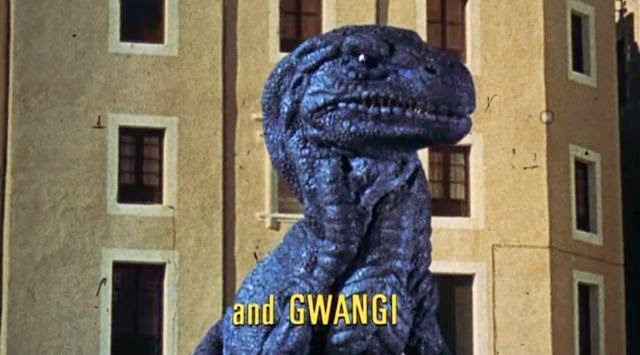 Of course one of the major influences for Riders of the Purple Lotus is Valley of the Gwangi. The original cowboys and dinosaurs movie. The image of cowboys roping a dinosaur feels like a natural fit. No wonder, since paleontologists were a part of the landscape of the old west. It was the time of the Bone Wars, after all. It feels natural that you'd find huge animals under the huge skies of west. And the deep time of a place like Arches National Park evokes prehistory from the present. The trailblazing adventurers roaming the Laramidia of RotPL have it a lot rougher than the cowboys that capture Gwangi, though. This is a lost continent, not just a hidden valley. Huge herds of herbivores eat and trample crops, fearless predators, practically immune to gunfire, have no fear of humans. Gwangi - Move 180'(60'); HD 15; #AT: 1 bite; DM 4d6; AC: 1(descending)/18(ascending); SA: sever limb, on a natural 20, the target has a random limb bitten off.